Take Route 80 west to the last exit in New Jersey (Millbrook/Flatbrookville). At bottom of ramp, turn right. Office is three miles on left. 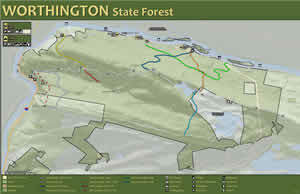 Some of the most rugged terrain and splendid views of northern New Jersey are found in Worthington State Forest. A rocky and sometimes steep trail follows Dunnfield Creek from the Delaware River to Mount Tammany or hikers may choose to follow the trail to Sunfish Pond, one of the most popular sites in the area. Millions of years in the making, the pond was carved out by glacial forces during the last ice age and is one of fourteen rock-basin lakes between the Delaware Water Gap and the end of Kittatinny Ridge. A trail circles the pond, with many boulders and openings for resting and observation. Office Hours: daily 8 a.m. to 4:30 p.m. Interpretive programs are offered seasonally from April to October in the campground. Programs are also offered year round for schools and organized groups. Please contact the office for special dates and times of events. There are over 26 miles of trails within the park including 5 miles of canoe trails on the Delaware River and over 7 miles of the Appalachian Trail. All trails within the park are hiking only. A demanding climb to the top of Mt. Tammany at 1527 ft. above sea level rewards the park visitor with a panoramic view of the Delaware Water Gap. A new interpretive trail, the Rockcores Trail, has been developed and offers some natural and historic information to the park visitor. 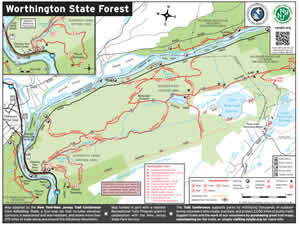 The Appalachian Trail passes through Worthington to Stokes State Forest and High Point State Park. One of the earliest roads in the region - the Old Mine Road - skirts the forest along the Delaware River. The road was used for transporting copper and slate from the mines and quarries in the area, and is believed to have originally been a well-defined Indian trail. The trail was also used by fur traders and Dutch settlers. Hikers, fishermen, bird watchers and other naturalists can follow this moderate trail through a mature hemlock and mixed hardwood ravine along Dunnfield Creek. This area is designated a Wild Trout Stream and supports a healthy population of native brook trout, the state fish of New Jersey. This impressive glacial lake, surrounded by a chestnut oak forest is reached by a steep and rocky climb along the Appalachian Trail. No swimming or camping is permitted at this area, however, 1/4 mile south of the pond along the Appalachian Trail is a backpacking wilderness camping area. This camping area is monitored by a caretaker who teaches Leave No Trace techniques, precautions on Living in Bear Country and enforces the No Fire regulation. Campsites: 69 tent and trailer sites with picnic tables and fire rings. Open April 1 through December 31. Campsites 1-77 have modern toilets and showers. Fee: NJ Resident $20 per night; Non Resident $25 per night. Campsites 1-23 are designated Tent Camping only. No trailers or camper vans are permitted. Group campsites: Three group sites with picnic tables, fire rings, and modern toilets. Open April 1 to December 31. Each campsite accommodates up to 35 people. Fee: NJ Resident $70 per night; Non Resident $140 per night. Excellent fishing can be found along the banks of the Delaware River in Worthington State Forest The river has abundant populations of Smallmouth Bass, Walleye, Channel Catfish and the spring run of American Shad is always a highlight to the fishing season at Worthington. Please refer to Division of Fish and Wildlife regulations. There is a boat ramp available at Worthington State Forest. Boating is open seven days a week year round. Worthington is an excellent place to launch canoes and kayaks for a trip on the river. If you do not have your own boat there are many local outfitters that rent canoes and kayaks for river trips. 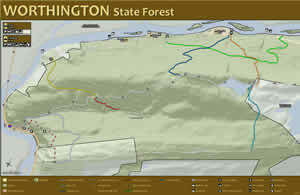 Stop at the Forest Office for more information about the river. Abundant populations of deer, turkey and small game offer many hunting opportunities for the public. Hunting is subject to New Jersey Division of Fish and Wildlife regulations. A small family picnic area has been added to the area and offers a peaceful, picturesque setting under a hemlock grove near the Delaware River. Limited space is available.